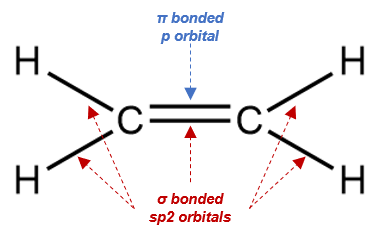 An sp2 hybridized orbital is an atomic orbital achieved by the interference of one s orbital with two p orbitals. This gives rise to three degenerate hybridized atomic orbitals. The sp3 hybridization helps us understand the structure of single bonded hydrocarbons. i.e. when carbon is bonded to 4 other atoms. On the other hand, sp2 hybridization, helps us understand the structure of double bonded hydrocarbons like ethene, propene, etc. In this case, the carbon atom is bonded to only 3 other atoms. Therefore, one s orbital interacts with 2 p orbitals, to form 3 degenerate sp2 hybridized orbitals.